One of the main decisions to be made by someone interested in investing in the stock market is whether they want to do so through a full service broker or a discount broker. The first step towards doing so in understanding exactly what a stockbroker does. A stockbroker is either an individual or organisation that is a registered member of the stock exchange. They have a license allowing them to participate in the securities market and buy and sell stocks on the behalf of their clients. Full service or traditional brokers are those who provide facilities for trading, research, and relevant advice to their clients about currency, stock and other commodities. They charge a certain percentage of every trade executed by their clients as a percentage. Through full service brokers, trading and investing in Forex, Mutual Funds, Insurance, Bonds, IPOs, and FDs can be done as well. Discount brokers, on the other hand, provide only the trading facility for their clients. There is no advisory capacity which suits clients who have knowledge of the market or wish to learn on their own terms. They provide low brokerage combined with a platform for trading in stocks, derivatives, and commodities at high speed. The main difference comes in the brokerage fees and the primary services offered by both. Full service brokers generally provide advice as well as the platform for executing trades. They charge brokerage rates that fall typically between 0.3 and 0.5% of each trade executed to earn their commission. Discount brokers, on the other hand, offer a flat fee that is generally Rs.20 per trade. Full service brokers are best for those who wish to have advice on their investments and face to face customer service. Generally, various add-on services like research reports, recommendations, extended margin, and funding are offered by full service brokers for their clients. Discount brokers are more suitable for someone who wishes to research on their own. They provide only online services for the clients and concentrates primarily on only trading. 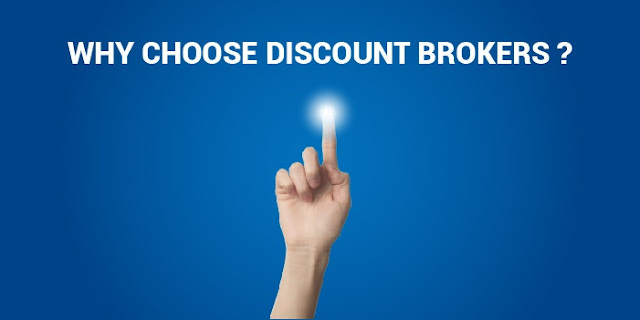 Moreover, while full service brokers may have 3-in-1 accounts that include saving, demat and trading, this is not a service that is provided by many discount brokers. When it comes to choosing, it always comes down to your own knowledge, preferences and the time you have available. It depends on whether you require additional services and advice on your financial investments. If you have sufficient knowledge and time, then it is always better to not pay extra commission. This can ensure that the investment you make on your stocks is not diminished due to having to pay huge amounts as commission to your stockbroker. By choosing from among the best discount brokers, you can continue getting the most out of the investments you make in the stock market. The amount of brokerage that you need not pay your broker itself is reason enough to opt for a discount broker. You can get full returns by making this decision.